Merry Christmas from Tellers of Weird Tales! I have looked through image after image for the right one to wish everyone a Merry Christmas. This one, created by Margaret Brundage for an issue published eighty years ago this month, is it. It even says Dec. 25 in the upper right corner. But if someone in a red outfit comes to your house that evening, you sure don't want it to be this guy. A jolly old elf would be much better. I'll end my alphabetical list with another unknown and no doubt another pseudonym. He or she was Aalla Zaata. I doubt that any person has ever borne that name. 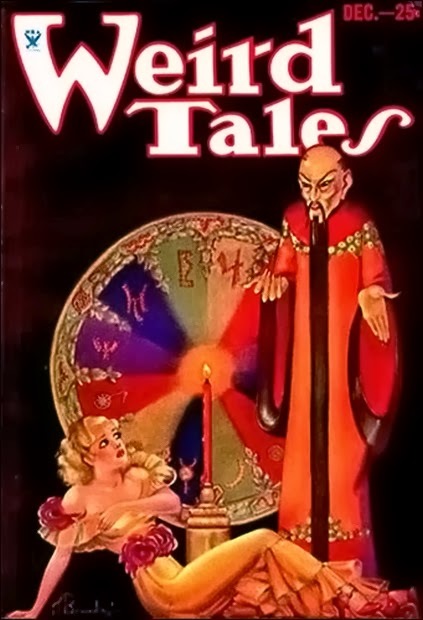 Mr. or Ms. Zaata wrote one story for Weird Tales from 1935. And so ends my A to Z list. Update (Mar. 7, 2017): According to a reader, Aalla Zaata was the pen name of Dora Black Russell, also called Winifred (Brent) Russell, also called Dora Winifred Russell. I will do further research and write a new article about her as time allows. Katherine Merrite (or Merrit) Yates was born in 1865 and by the early 1900s was writing books for children under her own name and under the name E.E. Steven or Stevens. At some point she lived in Hawaii. Her one story for Weird Tales, "Under the Hau Tree" (Nov. 1925), refers to a species of hibiscus native to the South Pacific and part of the flora of Hawaii. Katherine's book "Chet" (1913) was illustrated by Harold S. De Lay (1876-1950), who later contributed to Weird Tales as well. Katherine Merrite Yates died in 1951. 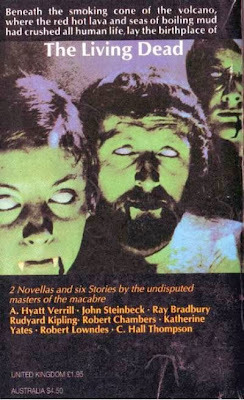 The unknowns continue [from the previous article] with Katherine Yates, author of "Under the Hau Tree," published in Weird Tales in the November 1925 issue and reprinted in Magazine of Horror #11 (Nov. 1965) and in The Plague of the Living Dead (1970). Katherine Yates may or may not have been the children's book author Katherine Merritte Yates (1865-1951), aka E.E. Stevens. The last names of Hasan Vokine and Henri Decrouet do not end in X. Whose names do? But both are unknown authors (hence the X) and both were probably pseudonymous authors. If that's the case, then there may have been some likely suspects among the editorial staff of Weird Tales or among their close friends and associates. The curious thing is that Vokine and Decrouet wrote three stories for Weird Tales, so they weren't just filling in. I wonder why they just didn't come out and reveal who they were. Pulp magazines gave many people a chance to live double lives. Readers could escape to the big city or into the Old West, to the jungles of Africa or into lands of long-ago or never-were. Writers of pulp stories might labor away in offices or on farms by day, but at night or on weekends or in their little odd hours, they could play author. And it wasn't just play. If they were good enough, and persistent enough, and maybe lucky enough, they could see their work in print. Theodore Snow Wood may have been one of those. By day he was at various times a lawyer, a bookkeeper, an auditor, an accountant. But when he stepped out of his office and stopped by the newsstand to pick up a magazine, he would have seen his own byline there as a published author. John Wood died in 1907. In 1910, his widow, Antoinette Wood, lived with her youngest son, Theodore, in New York City. The two were recorded in New York (either in Manhattan or The Bronx) in the censuses of 1910, 1915, and 1920. Antoinette Wood may very well have passed away in 1920 or 1921. In any case, Theodore S. Wood married a young Marcella Plint on April 3, 1921, in Manhattan. In 1930 and 1940, Wood and his family were in Ridgefield Park, New Jersey, where he continued to work as an accountant. Theodore Snow Wood died in the fall of 1940. (See his son's comment below.) And that is all I know of him. This posting is a revision to a previous version in which I misidentified Theodore Snow Wood's parents as Jonas Wood and Angenette G. Harwood. The comments below refer to that original version. Thanks to SOC for pointing out the error. Revised again on November 19, 2014. Thanks to Randal A. Everts and a family member of Theodore Snow Wood for further information. Hurley von Ruck, author of "The Terrific Experiment" for Weird Tales (Sept. 1925), was the daughter of Benjamin Franklin Webster (1835-1903), an attorney, and Mary E. Bragg (ca. 1845-1902). Born on April 22, 1874, in Webster Groves, Missouri, she married Silvio Henry von Ruck (1875-1918) by 1900. Silvio von Ruck was a physician and the son of a physician. He was born in Kent, Ohio, of Karl von Ruck, a Turkish-born German national, and his American wife, Delia Moore von Ruck. The elder Dr. von Ruck was a world-renowned authority on tuberculosis, also called consumption. 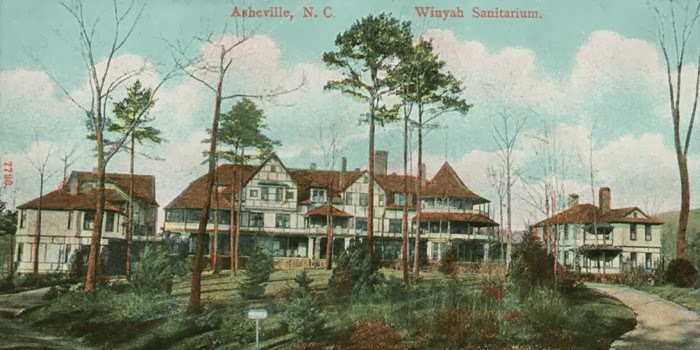 He established Winyah Sanitarium in Asheville, North Carolina, and helped turn that mountain town into a haven for sufferers from the disease. Silvio von Ruck assisted him in his work. A graduate of Toledo High School, the University of Michigan, and New York University, Silvio von Ruck also studied in Vienna and Berlin. Together, Silvio von Ruck and Hurley Webster von Ruck had a daughter. Born in 1902, she was named Silvia, no doubt after her father, but fittingly also (though perhaps not by intent) after the forests of the Blue Ridge Mountains. (The Blue Ridge Mountains are the birthplace of forestry in America.) There can be no answer as to why suffering descends upon some people beyond their share. Hurley von Ruck is a case in point, for in a period of a week in April 1918, she lost her husband and her sixteen-year-old daughter to pneumonia. Her own parents were already gone. (They had died in 1902-1903.) Within four years of the double blow of husband and daughter dying, Hurley's in-laws also passed away, Delia von Ruck in 1921, Karl von Ruck in 1922. In 1925, Hurley von Ruck's lone story for Weird Tales, "The Terrific Experiment," was published. I don't know what the story is about, but the title suggests a triumph of science, perhaps over illness. Hurley von Ruck lived at Winyah Sanitarium in Asheville, North Carolina, from at least 1900 to after 1920. In 1930 she was a guest in a private home. She died on April 7, 1934, in Asheville, only two weeks away from her sixtieth birthday and from the sixteenth anniversary of that terrible week in which she had lost her family. You can read a description of the von Ruck house and a little on the biography of Karl von Ruck on the website of the National Register of Historic Places, here. "Dr. Silvio von Ruck Dies," New York Times, Apr. 8, 1918. "Dr. Karl von Ruck," obituary and photograph in The American Journal of Clinical Medicine, Dec. 1922, pp. 861-863. Winyah Sanitarium, Asheville, North Carolina, established by Doctor Karl von Ruck for treatment of tuberculosis. The sanitarium was home to Hurley von Ruck for many years. The von Ruck family vault at Riverside Cemetery in Asheville, North Carolina. Photo by CathyO at Find-a-Grave. He also contributed to Wings, which was edited by Stanton A. Coblentz, as well as Blue Moon, Pagan, Tambour, and I'm sure many other magazines. Upper was included in an anthology, District of Columbia Poets (1932), edited by Henry Harrison. The two poems below reveal a man who must have endured turmoil and despair, but only for so long. Joseph Upper Harris died in 1954 and was buried at Brookside Cemetery in his native city. The blinding turmoil of an ugly world. Of all those delicate petals dreaming on the still surface. There is no such peace. You will find tidbits on Joseph Upper scattered across the wide face of the Internet. Lida A. Wilson was born in about 1881 in Ohio. Unfortunately I don't know when or where, nor do I know the names of her parents. And although she attended college, I don't know the name of the institution. Sometime after 1900, she married Charles Gainer Turner (1881-1964), who over the course of his life was a druggist, a businessman, and an inventor. The couple lived in Atlanta and adopted a daughter named Virginia. Lida Wilson Turner had her verse published in Georgia Poets: An Anthology of 33 Contemporaries (1932), Readings in Georgia Literature (1941), and in her own collection, Flagstones and Flowers (1934). She also wrote the words to a song, "Gypsy Music," with music by Bonita Crowe. Lida Wilson Turner had one poem published in Weird Tales, "The Crow" in the June 1930 issue. The lyrics I would write. wheeling regally in endless space? I, who love the little songs of here? A baby's laugh--I am in tune with these. But music from the universe beyond! Could I endure such ecstasy of sound? Some early harebell ringing close to ground? Lida Wilson Turner's papers exist in a library somewhere, but I'm not sure where. If you can find the books mentioned above, you can read more of her poetry. Solon Kelly Stewart was born in Brackettville, Texas, in June 1883. His father, Solon Stewart (1853-1923), was a Maryland-born lawyer and a member of the Texas legislature in 1881-1883. His mother, Laura Georgia Grimshaw (1858-1929), was a housewife. Solon K. Kelly worked as a clerk and by 1905 as a reporter in San Antonio, Texas. In 1909, he traveled to London to marry. I don't know why he would have gone so far afield to find a wife, but it's worth noting that his mother's father was born in England. In any case, Stewart returned to the United States in time to be counted in the 1910 census with his young wife, Nesta. Solon K. Stewart enlisted in the Canadian army during World War I and served in the Royal Garrison Artillery. He returned once again to his home country in August 1919 and was counted in the 1920 census, but by then tragedy had struck: Nesta Stewart was gone. That was the time of the Spanish Influenza. I wonder if she could have been carried away even before her husband might see her again. "The Contract of Corporal Twing" appeared in Harper’s in February 1923 and in The Best Short Stories of 1923. That success would have been reduced by the death of Stewart's father, Solon Stewart, in March 1923, only a month after the publication of the story and coincidentally the month Weird Tales made its debut. Stewart's mother died in 1929. So in a period of a decade or so, Stewart saw at least eleven stories and articles placed in American magazines while losing his wife, his father, and his mother. The last story I have found for him is "Bibi Love," published in Oriental Stories in the April/May/June 1931 issue of that companion magazine to Weird Tales. In a letter from Robert E. Howard to Tevis Clyde Smith, dated about March 1931, Howard wrote: "He [Harold Preece] also wanted to take me around and introduce me to Solon Stewart, the solitary writer, but I didn't have the energy." That letter and the story in Oriental Stories are the last two mentions of Solon K. Stewart that I have found. I don't even know the year of his death. Solon K. Stewart's parents were buried in San Antonio. Their house at 114 Cedar Street is part of the King William Historic District in that city. An Internet search for "Solon K. Stewart" and "Solon Stewart" will turn up a few items of interest, especially an account of the McNeil train robbery of May 18, 1887. Solon K. Stewart's byline appeared on the cover of Oriental Stories in the Spring Issue, 1931. 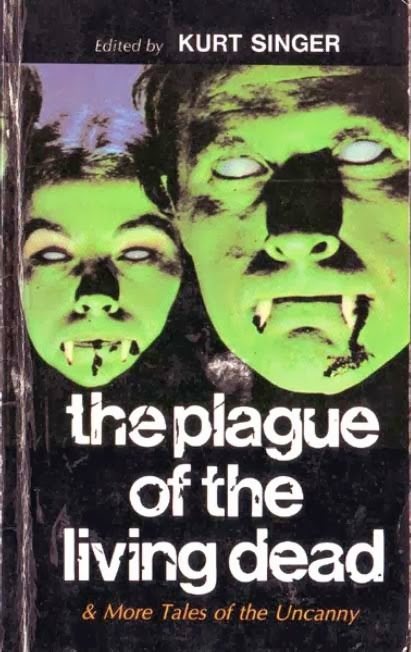 The cover artist was Donald von Gelb. A few days ago I wrote about Elizabeth Virgins Raplee. Today I have learned that her name was Elizabeth Virginia Raplee, and with that information, more comes to light. A question remains, however. The name Elizabeth Virgins Raplee comes from Jaffery and Cook's Collector's Index to Weird Tales. So was that a misprint? An error made by the authors? Or was that the original credit in Weird Tales magazine of October 1937? In any case, Elizabeth Virginia Raplee was born on November 17, 1900, in Clayton, New York, and grew up in Watertown. In 1910 (as Elizabeth M.V. Raplee), she was enumerated in Champion, New York, with her granduncle, Arthur Johnson, and his sister, Mary J. Johnson. In 1920, Elizabeth was still in Champion and still with her aunt, Mary J. Johnson, and Mary's nephew, John Johnson. Finally, in 1940, Elizabeth Raplee was back with her French-Canadian mother, Mary Adam, and her brother, Francis Raplee, in New York, New York. Elizabeth was employed as a secretary at Standard Oil at the time. Elizabeth Virginia Raplee last resided in Carthage, New York, and died in March 1982. She was eighty-one years old. Follow me weirdly in the deepening gloom! Of that dark realm to which we're all addressed. Wrenched from your body in its earthy bed? The wall or desk of one as yet unborn! (1) From "Home for Broker Raplee," New York Times, Aug. 17, 1905, p. 3. See also "Banker To End Days in Dependents' Home," New York Times, Oct. 10, 1905, p. 6. (2) The Farm Colony now lies in ruins. If decadence is at the root of the weird tale, then the Farm Colony could be the setting of just such a tale. (3) In the Niagara Falls Gazette, February 17, 1940, p. 6. Thanks to Randal A. Everts for confirmation of the name and dates of Elizabeth Virginia Raplee. A--Who was Stafford Aylmer? Where did he live? What did he do for a living? Did he write anything more than just two stories? B--What is there to tell about George Washington Jones Blume? What of his life? 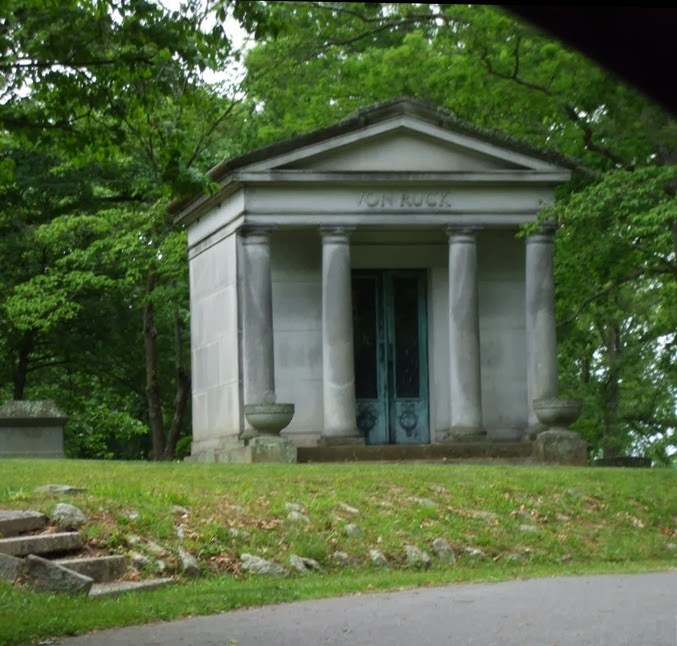 What was the place of his death? C--How did the story start that O.M. Cabral was a pseudonym of Kenneth H. MacNichol? D--As a literary agent and editor, Laurence R. D'Orsay played a prominent part in the history of science fiction by employing and teaching Henry Kuttner. He may very well have had other connections to the science fiction scene in Los Angeles. Yet his biography is pretty skimpy. What more can we learn about him? E--What more of Horatio V. Ellis? F--Or of Alice Drayton Farnham? G--Francis D. Grierson is covered pretty well. 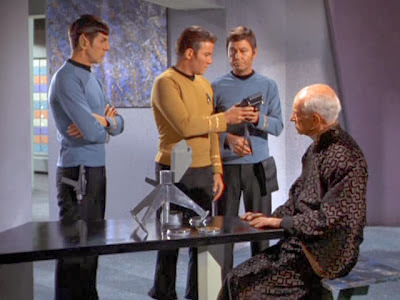 H--Without wanting to pry too much, I wonder what happened to Norman Elwood Hamerstrom. I--I wonder, too, about Alice I'Anson, her family, and her peregrinations. J--Talbot Johns--another pretty skimpy biography. K--Was Anthony D. Keogh actually named Mark Anthony Keogh? Did he die in March 1972? See an obituary (unavailable to me) dated March 25, 1972, in the Springfield [Ohio] Daily News. L & M--Laidlaw and Myers--pretty well covered. N--Was the Alan Nelson I found the same writer for Weird Tales and other magazines? O--What more of Anton M. Oliver? Where and when did he die? P--Of all the writers on the list so far, perhaps none has received shorter shrift from the Internet than Suzanne Pickett. After all, she had a book published this year. Q--Is the Janice H. Quilligan that I found the same poet for Weird Tales? I like to think Janice is still with us and still writing poetry. Does anyone know? Thanks and I hope to hear from you soon. Thanks also to all who read Tellers of Weird Tales and who leave comments and send emails. There is nothing better about writing this blog than to hear from family members. Janice Hall Quilligan was born on New Year's Day 1922 to Maurice J. and Marjorie Quilligan of Brooklyn, New York. Maurice was a U.S. Army veteran of World War I and a salesman of books and magazines. In 1942, he gave his occupation as sales manager for St. Joseph Magazine. Janice's siblings included Leila F., John R., and Maurice W. Quilligan. Janice H. Quilligan graduated from Bay Ridge High School in Brooklyn and from Hunter College in Manhattan. She worked ten years as reserve director of Bozell & Jacobs, Inc., an advertising and public relations agency. According to her obituary, Janice "had numerous articles and poems published in American and Canadian magazines" during the 1940s and '50s. These included "Avalon" a poem published in the May 1943 issue of Weird Tales when its author was twenty-one years old. "Avalon" had previously been published in the yearbook of Hunter College. Janice married Ralph Bottenus in 1962 and had one daughter, Valerie H.Q. Bottenus. In 1986, four years after the death of her husband, Janice Bottenus married Felix Klein (1911-1994), a Viennese-born graphologist and a survivor of the Holocaust. Her obituary states that "Janice studied and worked with him in his business, Manhattan Handwriting Consultant, which she carried on after his death in 1994." 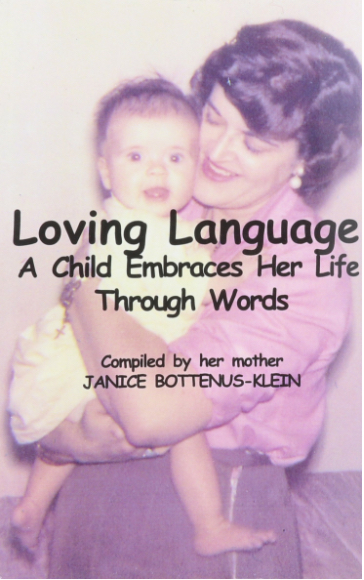 She wrote Loving Language: A Child Embraces Her Life Through Words (2005, as by Janice Bottenus-Klein) and arranged for the publication of Gestalt Graphology: Exploring the Mystery and Complexity of Human Nature Through Handwriting Analysis (2007), a collection of her late husband's papers. She was well loved, a world traveler, and a "devoted correspondent." Janice Hall Quilligan Bottenus Klein died on August 24, 2015, at age ninety-three and was buried at Greenwood Union Cemetery in Rye, New York. "Guide to the Papers of Felix Klein (1911-1994): 1930-2001" at the website of the Leo Baeck Institute Center for Jewish History, New York, New York, here. "Paid Notice: Deaths: Klein, Janice Hall" in the New York Times, Aug. 28, 2015, here. Janice Hall Quilligan, a photographic portrait from the yearbook of Hunter College, 1945. Courtesy of Valerie Bottenus by way of Randal A. Everts. 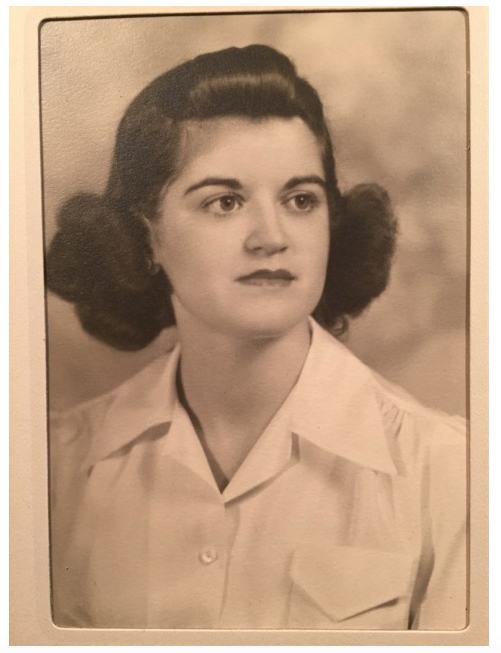 Thanks to Randal A. Everts for locating the obituary of Janice Hall Klein and to Valerie Bottenus for further information and the photograph of her mother from 1945. We have the vaunted Internet, brimming with information both true and false, trivial and profound, serious and ridiculous. So why does a writer like Suzanne Pickett go without a biography? I'm certain that someone will write to me with more information on her life, but that won't happen until I begin. Update (July 8, 2015): And now someone has written to me, and I thank Victoria Hallman (comment below) for doing so. Suzanne Pickett, also known as Sue Pickett, was born on January 19, 1908, presumably in Alabama. She saw her first published work on the children's page of the Birmingham News when she was just ten years old. Described as a Bibb County, Alabama, housewife, she also worked as a reporter and columnist for the Centreville News. Sue wrote six stories for Weird Tales, published from May 1952 to the final issue, September 1954. All but the last were reprinted in the British edition of Weird Tales. She also penned one published letter to "The Eyrie." Sue Pickett was the author of at least two books, Hot Dogs for Thanksgiving: A Memoir (1999), which was reworked and reissued as The Path Was Steep: A Triumphant Recollection of Life in the Appalachian Coal Fields and Mining Camps During the Great Depression (2013). Sue Pickett died on December 21, 1999, at age ninety-one. Although that is all I know of her, her granddaughter, Victoria Hallman, can offer much more. August 31, 2014: See the update below for more on Suzanne Pickett. July 8, 2015: Second update with birth and death dates, thanks to Victoria Hallman. "Memoirist Sue Pickett shares an economics lesson, still meaningful" by Randall Williams on the website New South, Inc., here. 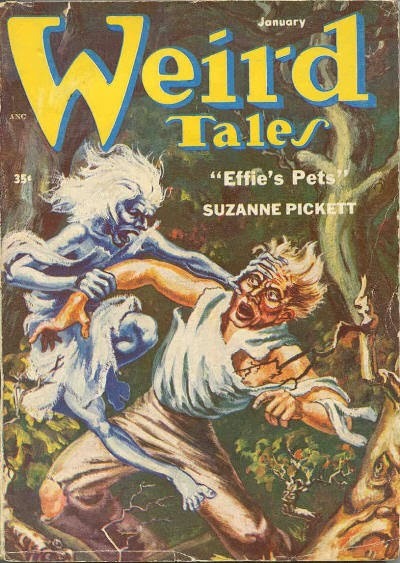 "Effie's Pets," Suzanne Pickett's fourth story for Weird Tales, earned her a spot on the cover in January 1954. She also had a letter printed in that issue. 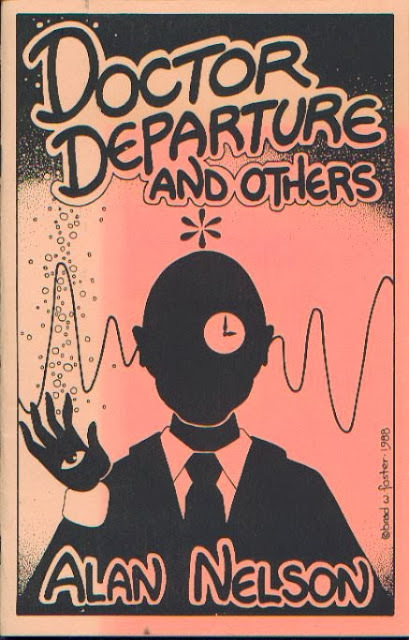 The cover artist was W.H. Silvey. Update (August 31, 2014): I am still lacking in some details on the life of Suzanne Pickett, but I have at least her own autobiographical sketch from the issue of Weird Tales shown above. As for myself, I am married, and my husband is Safety Director for Black Diamond Coal Mining Co., of Birmingham, Alabama. When he started working for them as Superintendent of their West Blocton mine in '42, he was the youngest Sup't in Alabama at that time. We have two daughters and two grandchildren. My first story was published at about age ten in the children's page of the Birmingham News, my second in a series in the Birmingham Post at age fifteen. But my talents were supposed to be music and painting, so I thought very little of writing, only had the urge to ‘dash off’ a story every five years or so. I write songs (naturally) poetry, etc. Four years ago the urge to write became so strong that I at last started working seriously, I have written and burned one novel and a half. Have three more almost finished, but my big one is a historical novel PAGAN which promises to be worth quite a bit of work. My weird tales come in a flash and are a pleasure to write. I'm glad you like them. Anton Maracek Oliver was born on May 20, 1888, in Budapest to Johann Oliver and Paulina Pavlik. He served as a lieutenant in the Austrian infantry and graduated from Vienna University in 1909. Oliver arrived in the United States before World War I and lived in Akron, Ohio, beginning in 1912. He also called Hagerstown, Maryland, and New York City home. Oliver was a violinist and played with the Cleveland Symphony Orchestra. On February 4, 1912, he married Beatrice Stowers, a singer, in Summit County, Ohio, presumably in Akron. He later married Ruth Frances Fiske, also a singer, of Wilkinsburg, Pennsylvania, and of New York, New York, on November 15, 1953. In 1917, when he filled out his draft card, Oliver was in Spokane, Washington, and employed by the Goodyear Tire Company. Oliver also worked for the Campbell-Ewald Company, Rickard and Company, and the Pangborn Corporation. He spent eight years with the McGraw-Hill Publishing Company, the last three as executive assistant to the president. In 1947, he formed Beatty and Oliver advertising agency with Robert S. Beatty. Anton Oliver was also a writer for The Coal Industry, India Rubber Review, The Kindergarten-Primary Magazine, and Power Plant Engineering. His lone story for Weird Tales was "The Living Nightmare" from the second issue, April 1923. Anton M. Oliver may have married a woman named Erika Kloz. That Anton M. Oliver died in 1977 and was buried at Muddy Brook Cemetery in Great Barrington, Massachusetts. 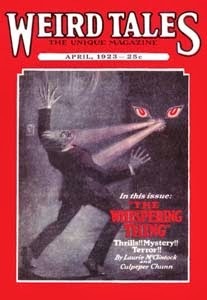 Anton M. Oliver's short story "The Living Nightmare" was in the April 1923 issue of Weird Tales. The cover was by R.M. Mally. Thanks to Donna Brown of the Mason Library, Great Barrington, Massachusetts, for further research. In tracking down the writer Alan Nelson, I started with the Internet Speculative Fiction Database, which gives his dates as 1911-1966. From there, it was to Ancestry and the only man named Alan Nelson with the same dates. If that's the right man, then he was born on December 11, 1911, in Las Cruces, New Mexico, to James W. Nelson (1873-1925), an agricultural agent and professor of agriculture, and Mary Blanche (Hayden) Nelson. Even as a child, James Alan Nelson went by his middle name, and he kept doing so even after his father's death in 1925. Despite their small number, Nelson's stories were reprinted repeatedly in book form. Alan Nelson is also credited as the writer of the teleplay for "The Horn" for the anthology series Tales of Tomorrow, broadcast on October 10, 1952, and featuring Franchot Tone, Stephen Elliott, and Barbara Joyce. James Alan Nelson died on September 9, 1966, in San Francisco at age fifty-four. Alan Nelson's stories were collected in Doctor Departure and Others (Gryphon Books, 1989) with cover art by Brad W. Foster and an introduction by Gary Lovisi. That book is the place to start if you want to know more about Alan Nelson. Unfortunately I don't have access to it and can't say with certainty that I have the right Alan Nelson. (1) Note the two Italian titles, "Cattivo" (bad, evil, or naughty) and "Silenzia" (mutes [?]). I don't want to make too much of it, but there could be some connection to a man who lived in Oakland, which was known for its Italian population. Update (Oct. 4, 2017: Alan Nelson in fact married an Italian woman, Gina Maria Bin (1919-1973) in 1951 in San Francisco.